Tomato potato psyllid (TPP) can carry a bacterium called Candidatus Liberibacter solanacearum (sometimes known as CLso or CaLsol) which is associated with the 'zebra chip' disease in potatoes. Following the detection of TPP in Western Australia, there has been extensive testing of TPP and plant material for the Candidatus Liberibacter solanacearum bacteria. There have been no detections of Candidatus Liberibacter solanacearum in Western Australian crops to date. What is Candidatus Liberibacter solanacearum? Tomato potato psyllid (TPP) can carry a bacterium called Candidatus Liberibacter solanacearum (somtetimes known as CLso) which is associated with the potato disease 'zebra chip'. TPP not only cause damage to plants through feeding but they can also infect plants with the Candidatus Liberibacter solanacearum bacterium which causes disease. 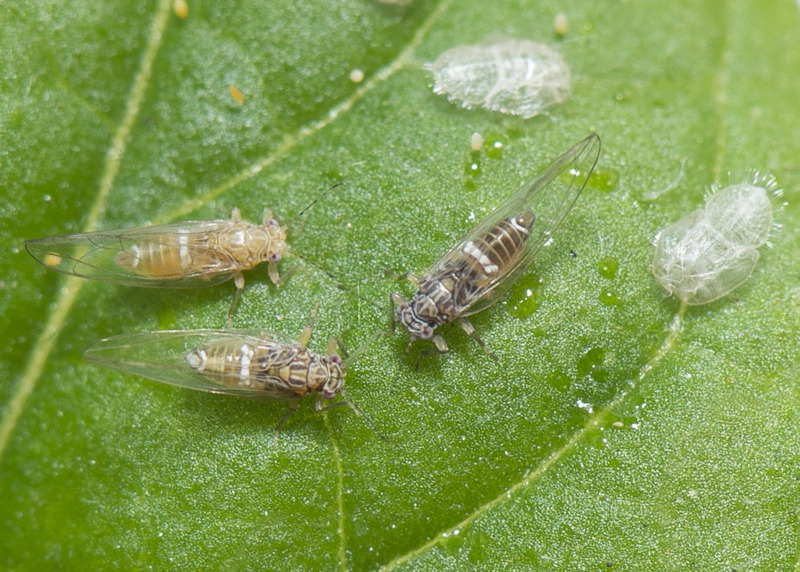 It only takes 1-2 hours of feeding on the sap for the psyllid to infect a plant. Candidatus Liberibacter solanacearum bacteria are grouped into five gene groups or haplotypes. Each haplotype infects different vegetable crops, and is spread by different kinds of insects (psyllids). Only haplotypes A and B can infect solanaceous crops, including potato, tomato, capsicum, eggplant, tamatillo, tamarillo and several weed species. Candidatus Liberibacter solanacearum haplotypes C, D and E can infect carrot, celery, chervil, fennel and parsnip. Symptoms of the Candidatus Liberibacter solanacearum bacterium on potatoes, tomatoes, capsicums and chillies may look similar to other plant conditions. Growers are urged to be vigilant. Tomatoes may be misshaped; or no fruit is produced; or there is an over-production of small, non-commercial grade fruit. Plants may have shortened internodes and aerial tubers may develop in the leaf nodes. Potato tops are likely to be smaller than normal. The foliage turns yellow and may have a burnt or purplish appearance. Stems may die completely but regrowth from the base may occur. Tubers from affected plants may have small stalked tubers protruding from the main tuber (called ‘chaining’) and when cut may show internal browning of the vascular ring or brownish streaks along the medullary rays. The Department of Primary Industries and Regional Development is working with industry and the community to manage TPP in Western Australia following national agreement it cannot be eradicated. Following the detection of TPP, there has been extensive surveillance and testing for Candidatus Liberibacter solanacearum. There have been no detections of Candidatus Liberibacter solanacearum in Western Australia to date, although in 2017, the Candidatus Liberibacter solanacearum haplotype D was detected in parsley seed imported from Italy (originating in France), and haplotype E was detected in parsley seed imported from Germany. See the Candidatus Liberibacter solanacearum declared pest page for current information on the detections. However, no types of Candidatus Liberibacter solanacearum have been found in any Australian crops and the bacterium is not officially considered present in Australia. Everyone in Western Australia who grows potatoes, tomatoes, eggplants, chillies, tamarillos or sweet potatoes should regularly monitor their plants for pests and diseases. send a photo to the Department of Primary Industries and Regional Development via the MyPestGuide Reporter app available from the Google Play or Apple store. call the Pest and Disease Information Service on (08) 9368 3080. All suspect signs of TPP/Candidatus Liberibacter solanacearum will be investigated.